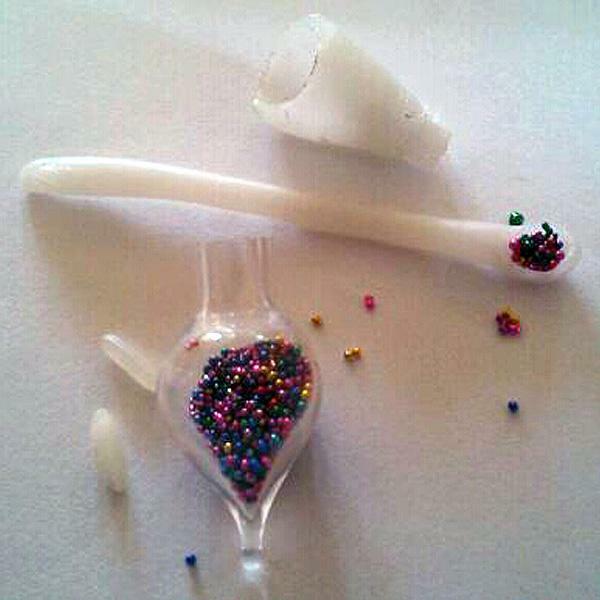 Tammy made a tiny Plastimake scoop and funnel for working with microbeads. These things are absolutely minuscule, the two white objects in the bottom left corner are grains of rice! This surely sets a new record for the smallest Plastimake creation we've ever seen. I work with very small microbeads all the time. I was sick of trying to not spill them everywhere. So I made my own funnel and spoon out of Plastimake. The scoop part on the spoon I made by pushing a ball end pin into it.